Mercedes-Benz has opened a new factory in South Carolina where it will build its latest generation Sprinter van. 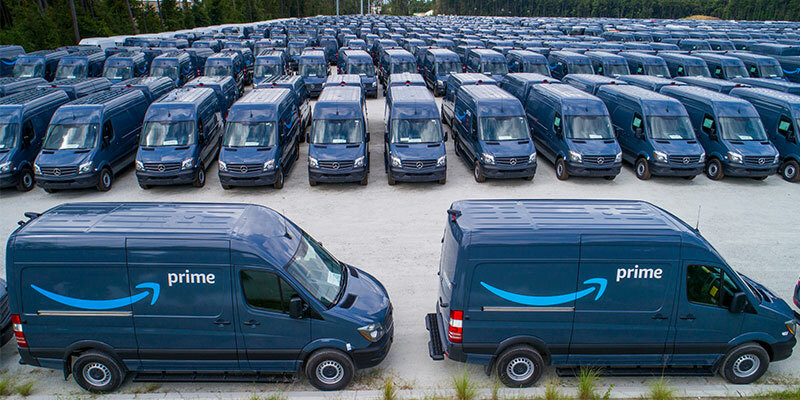 The German automaker chose the factory opening to announce one of its first big orders was a deal for 20,000 Amazon-branded Sprinters for the online retailer’s new Delivery Service Partner program to be delivered by the end of next year. It’s a huge contract for Mercedes, which last year sold 27,415 Sprinter vans, including those marketed under the company’s Freightliner brand. The Amazon program provides owners of new package delivery companies of 20 to 40 vans with customized vehicles through special leases to reduce startup costs, said Dave Clark, Amazon’s senior vice president of worldwide operations. Both the Mercedes-Benz and Freightliner Sprinters will be manufactured at the new factory. The new plant is an expansion of a previous facility that assembled CKD kits imported from Germany. It includes two new buildings, a 450,000-square-foot paint shop and a body shop of more than 500,000 square feet. A 1.2-mile conveyor connects the two facilities. Mercedes-Benz spent $500 million on the factory expansion. The plant will employ up to1,300 workers to build an prospective 40,000 vans annually using up to 182 robots. Building cargo vans in the U.S. allows Mercedes to avoid a 25 per cent tariff on imported commercial vehicles and trucks. The 2019 Sprinter is the third generation since its debut as the company’s flagship van in 1995. This model replaces a van that entered the market in 2006. The new Sprinter will be the U.S. version of the van that debuted in Europe earlier this year. Mercedes executives said the automaker had invested $US2.9 billion in the new van and expects this generation to be sold for 10 years. The Sprinter has been a worldwide success. Mercedes has sold more than 3.4 million globally, including a record 200,500 Sprinters in 130 markets last year. Although strictly considered a work van used for package delivery, building trades and other commercial ventures in much of the world, the Sprinter has become popular for recreational and surf van conversions in the U.S.
About half the vans sold in the U.S. have commercial uses. Another 30 per cent are built for the recreational vehicle trade and about 20 per cent are sold as passenger shuttles and for other uses, according to Mercedes. One of the more popular configurations is a diesel van with four-wheel drive. But such vans have been in limited supply. Mercedes has had trouble getting key components for the drive system from a European supplier. That’s expected to continue for some time, even with the new South Carolina factory coming on line, said Olaf Petersen, general manager for Mercedes-Benz van marketing in the U.S. Eventually Mercedes plans to find a U.S. supplier for the components, the automaker said. A key change for the North American market is the introduction of a petrol engine option that will be available next year. The current version comes equipped with a diesel engine. U.S. buyers will pick from vans equipped with a 3-liter turbodiesel six-cylinder engine or the new 2-litre gasoline engine. The diesel engine vans will use a seven-speed transmission that is more efficient than the five-speed it replaces. The gas engine vans will have a nine-speed transmission. Offering a gasoline version will satisfy customer demand and make the Sprinter a better fit for the rental market. It also will provide a lower-cost option than the comparable diesel model, Mercedes-Benz executives said. Both should boost the automaker’s sales and market share in the Euro-style cargo van market, the executives said. The 2019 Mercedes-Benz and Freightliner Sprinter gasoline-powered cargo van starts at $33,790. A comparable diesel version will start at $39,700. The van is considerably more expensive than U.S. rivals; the Ford Transit, Nissan NV and Ram ProMaster (Fiat Ducato) all start in the low- to mid-$US 20,000 range, depending on the vehicle. Ford’s Transit is the US market leader, selling 127,000 vans last year. The current model dates back to 2013 and is expected to get a redesign soon.